We timed our departure from Littleton to avoid the Hartford rush hour. As a result, we breezed through the town without any delays. 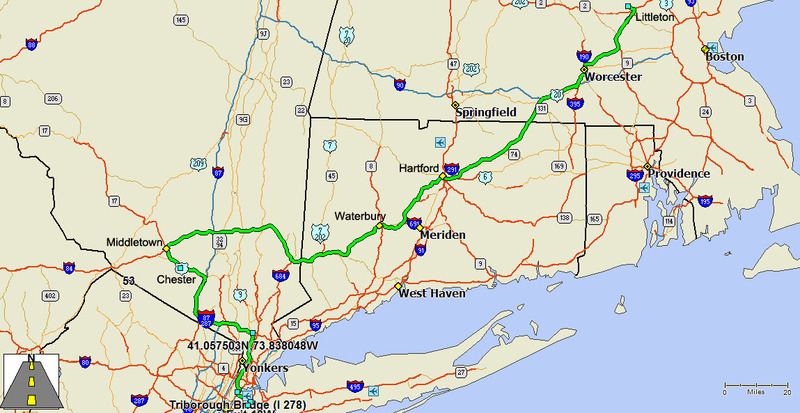 We also easily traveled through the other major bottlenecks on the route, Worcester, Waterbury and Danbury. We had the trailer unloaded and secured in the storage area by 12:30. We saw most of what we wanted to see. Unfortunately the weather didn’t always cooperate and we missed places like Halifax and Lunenburg that we really did want to see. The persistent haze and clouds had a negative impact on our photography, but we still got some great shots. We now have an excuse to go back to the area in the future. There are portions of Nova Scotia and Prince Edward Island that we have not seen but would like to. Everyone we met, from locals to other campers, told us we missed out by not going to Newfoundland/Labrador. We were told that the province is not to be missed. Besides, it is now the only Canadian Province we had never been in and we have to fill in that province on the map decal on the trailer. The mechanical problems we had on the trailer created some anxiety, but in the end were not too bad. Being stuck in the Boston area gave us an opportunity to spend more time with our grandson, Ben. Like they say, “we turned a lemon into lemonade.” The broken spring shackle prompted us to shorten the trip by a week. But, on the plus side, it could have happened in the middle of the Alaska Highway with the nearest repair facility hundreds of miles away. To us any travel is better than sitting home contemplating what we could have done. This trip will not curtail our desire to travel. It reinforced some lessons on what we need to do prior to departure to reduce the probability of similar problems “ruining our day.” We already discussing possible trips for next summer with a return to Alaska high on the list.